We’ve been without wifi for a few days – sorry about the lull in communication. The journey on the A9 north from the cultural triangle was dramatic in many ways. The climate, people and political situation changed completely. We were tourists of a different sort as Ramanan and his brother-in-law (Suresh) showed us around Kilinochchi and the area of most fighting in the civil war (23 July 1983 – 18 May 2009). Although we took as many photos the mood had changed. There were great stories of hope and gospel ministry but set against a terrible past. Kilinochchi was the headquarters of the LTTE (Liberation Tigers of Tamil Eelam) during the war. It was completely destroyed and even now, although the shops along the main A9 have been rebuilt if you go 100m behind them there has been no redevelopment and the Tamil people are still in poverty. This a hot, dry and dusty place. Yet the Lord can grow fertile plants even here – Suresh is doing amazing things here. 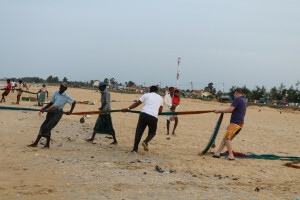 Projects he is involved in include teaching Tamil Pastors and the orphanage that he took us to. Always a visionary Suresh registered ‘Hebron Bible Ministry’ as a Christian Charity back in 2000 as pretty much the last Christian organisation allowed to be registered there. Then he bought some land in Kilinochchi (which used to belong to a Hindu priest) and has pretty much built an orphanage himself raising funding and creating a self-sustaining ministry – he is planting fruit trees etc. which now bring in their own income so they do not have to rely on foreign donors forever. It was so encouraging to see what God is doing is such hard soil. The north is hot and the scars of war are everywhere – plenty of buildings still riddled with bullets and in ruins. However, the people are amazingly friendly and God is still good. All of this leaves much to process. Most of us have finished reading “Anil’s Ghost“, by Michael Ondaatje and “The Road from Elephant Pass“, by Nihal De Silva (two novels set against the backdrop of the civil war… Anil’s Ghost is excellent, the other one gives some good geograhical context but reads more like an essay written at school as part of an assignment on the civil war.) We have also read all the government ‘information’, plus heard many stories from Ramanan and Suresh. What to make of it all? Most of all that the only hope for Sri Lanka is found in Jesus Christ. Thanks for your prayers for HBC! You can see all our updates on the Facebook page or on Twitter!! We had a great first day today and looking forward to the rest of the week!